Decoration trends keep changing with the times, but some are really worth holding onto for a while. The Japanese inspired wabi-sabi décor is an eye-catching trendsetter that’s here to stay. This interior designing context follows a Japanese philosophy that’s been around since the fifteenth century. It’s all about finding beauty in imperfections, a direct contrast to lavish over-ornamentation and use of exotic features to decorate homes. ‘Wabi’ refers to living with simplicity and humility while ‘Sabi’ refers to accepting things as they are – imperfections included. The wabi-sabi philosophy teaches you to re-train your mind to find positives in less-than-perfect scenarios. It trains you to embrace things the way they are instead of striving for perfection. Get rid of clutter – To inspire peace and tranquility of mind, it’s important you keep the home organized and free of clutter. Having free space within each room takes away chaos from life and adds depth into your home. Bring in nature – Earth elements and organic materials bring in good vibes and introduce the wabi-sabi principles through the imperfections present in natural elements. Including lush green plants and materials like terracotta, untreated wood elements and other natural materials with exposed imperfections add authenticity and simplicity into your home. Add simplicity – Since the wabi-sabi principle dwells on simplicity, you can introduce all kinds of natural elements into your home. Functional items are the focal point of wabi-sabi décor and you can use literally anything that has a past, is chipped, cracked or irregular in shape, art you created or some memento from a cherished vacation. Imperfections are perfect – Décor doesn’t always have to be matched up and cohesive. Too much matching can take away the character of a room and its soul. It’s ok to celebrate mismatched décor and pair up unlikely things together, especially if it’s something you love. Wabi-sabi is all about finding beauty in the aesthetic differences created by imperfections. Do note however that there is a big difference between clutter, clumsiness and the authentic beauty of imperfections. 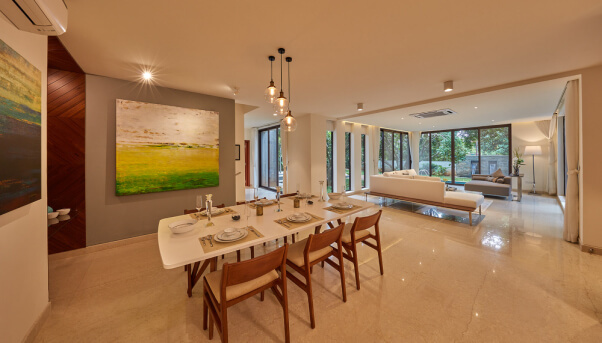 Wabi-sabi form of interior décor sits well with the nature-inspired ‘Under the Sun’ villas in Devanahalli, Bangalore. These spacious villas are located within a sprawling fruit orchard and is in tune with the perfect imperfections of natural beauty. Find more information about them here: https://www.underthesun.co.in/.